Nestled in Northern Michigan, Traverse City is one of the state's true hidden gems. Well known for its wine and beer-brewing culture, as well as being the home of a highly popular annual Cherry Festival, Traverse City is one of the state's top tourist hotspots, offering beautiful scenery and a whole host of opportunities for outdoor enthusiasts. Hiking, cycling, and kayaking are especially popular at TC, with the latter activity offering a wonderful way to explore the city’s twin bays and nearby lakes. Looking to enjoy some kayaking in Traverse City? If so, these are the companies to check out. Each one offers great kayaking services like guided tours and low-priced rentals, with friendly staff able to ensure that everyone has the best time while kayaking in this lovely location. Here are some important details and overviews of some of Traverse City’s top-rated kayaking companies and outfitters. Offering a range of guided kayaking tours and affordable rentals, The River Outfitters will give you all the equipment and help you need to have a fantastic kayaking experience in this beautiful Michigan location. Bike tours and paddleboards are also available from this company, but there's a big focus on kayaking. Three tours can be enjoyed, lasting between one and three hours overall and taking in various locations like Boardman Lake, Boardman River, and the West Bay. The shortest tour heads from the Union Street Dam to the West Bay area, while the longest takes kayakers from Boardman Lake down to a beach on the bay. Every tour is led by a friendly guide who will answer any questions you might have and teach you more about the city itself. Paddle TC is located in a beautiful location on the shore of West Grand Traverse Bay in the picturesque Clinch Park. Offering both kayak rentals and guided kayaking tours in Annapolis, this company is one of the best in the business for offering magical memories and super experiences from the comfort of a kayak. Rentals are fairly priced and Paddle TC's tours are aimed to suit all kinds of kayakers, from young novices to seasoned experts. Brewery tours, ecological kayaking experiences, and more can all be enjoyed on the city's beautiful waterways like Boardman River, Boardman Lake, and nearby Cedar Lake. 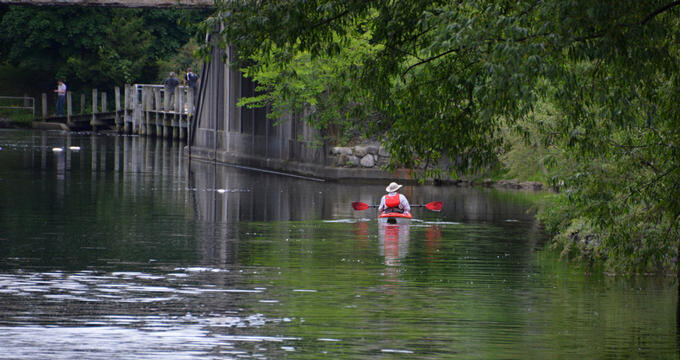 Paddling through the historic downtown neighborhoods of Traverse City, these kayaking tours are both entertaining and educational, with friendly guides leading the way and sharing fascinating information and insight into the heritage of history of Traverse City. Traverse City has a rich history when it comes to alcoholic beverages. The city is one of the top wine producing centers in the entire Midwest region and is also a popular spot for breweries, with a wide array of high quality craft beers being made in and around Traverse City. Kayak Brewery Tours gives you a chance to experience those great beers without having to worry about the calories, as you'll also be doing plenty of kayaking on the same day. Tours run on a daily basis and last for around four hours in total, with groups setting off along the Boardman River and stopping off at some of the city's best breweries for a 'KaBrew'. Cycling is also a part of these tours, which offer a nice mixture of physical activity and simple indulgence. For the best experience, be sure to check out these tours in November during 'Beer Week', when the whole city goes craft beer crazy. And of course, it goes without saying that these kayaking tours aren’t for kids!